Four days (split over two weekends): 9.30am–3.00pm. This is set to be an exciting, long-awaited four day Master Class! A very experienced tutor, two kilns, lots of enamels – a chance to learn something new & realise your designs in colour! This course will be an introduction to the exciting possibilities of vitreous enamelling, which is the fusing of ground-up coloured glass to a metal surface. We will talk about techniques, history and the work of well known Enamellers. You will learn how to prepare the metal (copper and sterling silver) and the enamels, how to do colour tests and the safe use of tools and kilns. We will explore the different effects you can achieve with opaque and transparent enamels and how to use background texturing with enamels. 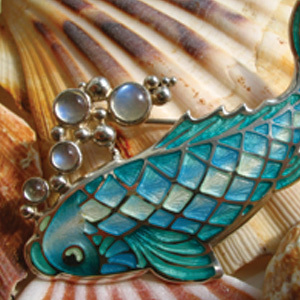 The course covers a variety of enamelling techniques like dry sifting, stencilling, sgraffito, graphite firing, wet packing and cloisonné, which will enable you to try these newly acquired skills on pieces of your own design. We will also cover how best to integrate enamel into a piece of jewellery. The course gives you an overview of a number of popular enamelling techniques and how to use them to best effect. This will enable you to choose techniques which suit your own work and style. It is a hands-on introduction to the beautiful world of enamelling, which might also inspire you to study your favourite technique more in-depths on an advanced course in the future. Gesine Garz has worked as a jeweller for the last 20 years and specialised in enamelling early on in her career. She has won a number of awards for her pieces (Goldsmith’s Craftsmanship and Design Awards and British Jewellery Association Awards) and is showing and selling her work internationally. She has been teaching jewellery diploma courses and short courses for the last four years and is a member of the British Society of Enamellers. Max of nine places available. Four day course, full attendance is required, places non-transferable. Full payment required to secure a place. A minimum of six participants are required for the course to run. Please note the cost of the course is not refundable. Once payment is received we will send an email confirming your place on the course – just let us know if you would like a place by calling 01582 833800. Participants will need to bring their own silver or purchase the necessary quantity from us.